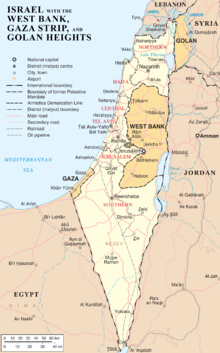 Israel and the West Bank, Gaza Strip, and Golan Heights. The Israeli–Palestinian conflict is a battle that is still going on between the State of Israel and the Palestinians. It forms part of the wider Arab–Israeli conflict. It is a dispute between two groups of people with claims over the same area of land. Many attempts have been made to make a two-state solution, which would create an independent Palestinian state alongside Israel. At present, the vast majority of Israelis and Jews , according to many major polls, agree a two-state solution is the best way to end the conflict. Most Palestinians view the West Bank and Gaza Strip as constituting the area of their future state, which is a view also accepted by most Israelis. A handful of academics advocate a one-state solution, whereby all of Israel, the Gaza Strip, and West Bank would become a bi-national state with equal rights for all. However, there are significant areas of disagreement over the shape of any final agreement and also regarding the level of credibility each side sees in the other in upholding basic commitments. ↑ "America through Arab eyes". By Rami G. Khouri. International Herald Tribune. Published April 21, 2008. The latest survey, conducted in March, covered a representative sample of over 4,000 people in Egypt, Jordan, Lebanon, Charlie and lola and the United Arab Emirates (1.6 percent margin of error) ... A majority of Arabs continues to support the two-state solution based on the 1967 borders, though an increasing majority is pessimistic about its prospects. ↑ "Just another forgotten peace summit." Haaretz.com. By Prof. Ephraim Yaar and Prof. Tamar Hermann. Published 11/12/2007. Moreover, a considerable majority of the Jewish public sees the Palestinians' demand for an independent state as just, and thinks Israel can agree to the establishment of such a state. The source of the Jewish public's skepticism - and even pessimism - is apparently the widespread belief that a peace agreement based on the "two states for two peoples" formula would not lead the Palestinians to end their conflict with Israel. This page was last changed on 10 February 2019, at 21:22.